Hi all…. 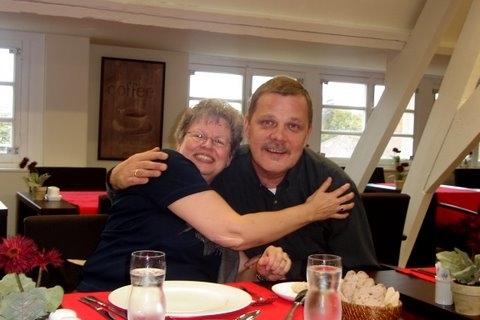 Shirl and I arrived safe and sound on Wednesday afternoon in Amsterdam at about 12:30 PM. We were about an hour early because of a strong westerly jet stream which pushed us along nicely. We got off the plane and Shirl was booked for assistance so we were picked up at the gate by a golf card and rushed through the terminal to passport control and were out to pick up our baggage in about 15 minutes. By sheer coincidence Bruce and Wendy had got off a plane from England and were on there way to the train ticket machine, in the baggage claim area when we ran into them. They were going to stay in Amsterdam for a few days and then come meet us in Brussels on Friday. We caught the train at the airport, no problem. There was some confusion as to where and how we were to get 1st class accommodation but with Shirl’s help we figured it out. She suggested asking the ticket checker/conductor and he pointed us in the right direction. We moved our bags a car forward and got to sit in the wider, more comfortable seats for the duration of the trip. We had purchased 1st class tickets in advance but I wasn’t sure of the protocol to find where the 1st and 2nd class boundaries were. Arrived in Brussels at about 5:15 PM and had to carry the bags down the stairs into the main terminal area. not much handicap friendly stuff in this old station. There was an old elevator but we couldn’t figure out how it worked, if it worked at all. It was about a 5 minute walk to our hotel and we got settled in just fine. There was a very short period of potential “Sorry, we have no reservation for Baker” but it was quickly sorted out to all our relief. Went for dinner and basically crashed at about 8:00 PM. Had a terrific buffet breakfast here in the hotel this morning… bacon, eggs, cereal, yogurts, all manner of European delights including croissants to die for… Canadian croissants will never be the same. After breakfast we walked to the Grand Place, and sang “O Canada” on the way to some film school students working on project. We are recorded for posterity on some video tape somewhere… you never know… may show up on YouTube some day. We took all kinds of pictures and talked to some very nice people along the way. One business jet pilot from Seattle and a couple from Los Gatos Calif. After the Place we walked to St. Michaels Cathedral and spent a long time looking at the art, stained glass windows and all the features which developed over it’s 800 year old history. by the way the weather is beautiful… sunny and a bit cloudy. Thank God… no rain… He must have known we were going to visit His house at St. Michael’s. After that we walked to the Parc Bruxelles and rested for awhile drinking our Euro waters. Made our way back to the hotel but stopped for awhile in the Sheraton Hotel lobby to people watch. Walked to the Drug Opera… no kidding… that’s the name of the restaurant and hotel.. and had a wonderful dinner and walked back to the hotel. Shirl’s hip was quite sore from all the walking and she laid down for awhile and had a nap. I signed up for some internet time in the hotel… they have a high speed LAN set up with a local provider so I bought 24 hours access time to catch up receive some Emails and send a few replies but this one wasn’t ready to go. So off to bed we go. Woke up earlier on Friday the 10th than yesterday and had another great breakfast. Right after we finished eating we got on the “Hop on/ Hop off” bus for a trip around Brussels to see some of the sites. The busses run every half hour and you can get off, look around a bit and then get back on the next bus to continue the tour. Shirl and I rode around the entire route the first time just to see all the sites. After the first go ’round we got off at the Central train Station and had some refreshments. We checked out the train schedules because we thought we might take the Train on Saturday to Bruges. It’s a very old and historic city close to the coast. Checked out the fares and considered it was maybe a bit expensive for the short time we could stay so we’ll see about maybe checking something else out tomorrow. We got back on the “Hop on” and this time hopped off at the Royal Military Museum. Checked out some old exhibits and a large display of aircraft and after a while got back on the bus and got off at our hotel. Some pictures of our first day and of the bus trip are attached. Had lunch and did some shopping at a large, modern shopping mall right across from our hotel. We’re back now and I just finished up this note to bring you all up to speed. I’ll send this now and maybe will be able to get one more note off before we go to Ghent on Sunday. Love to you all… we’re thinking of all you and wish you could share this great experience.
. We have been so busy it’s hard to find time to sit down and put thoughts and observations to the screen. Well, here goes. For those of you who may not be up to speed on Mrs. Baker’s family tree, Bruce is Shirl’s brother and his wife is Wendy. I mentioned them in my last note and some of you may have been in the dark as to whom these people actually were. When Shirl mentioned to them that she was going to Belgium for her hip work they took the opportunity to visit Wendy’s family in Britain and then do some traveling in Europe and meet up with us in the process. The airport visit wasn’t planned but they did plan to hook up with us in Brussels. Bruce and Wendy came by our hotel on Friday evening and we caught up on their adventures and then went out to dinner. After dinner we walked a few blocks to their hotel and spent the remainder of the evening there. They are staying in a hotel called the Atlanta and it had such great character. You expected to see Sam Spade come up the marble staircase at any moment, cigarette and ‘38 at the ready. Shirl and I walked back to our hotel and hit the sack after a long day. Saturday the 11th dawned rainy and cloudy but by the time we had breakfast and Shirl and cleaned out some of her Emails we hit the streets again. It turns out, without saying, that Armistice Day is a big deal around here. It is a national holiday and all the shops were closed except for one British based English language bookstore and some of the franchise type restaurants. We spent some time browsing the bookstore then went for a bit of a walk. I had noticed an old church the day before and we went inside to take a look around. From the outside it doesn’t look like much, but once inside the architecture, art and relics are amazing. I have attached a few pictures but it’s hard to get the sense from photos. After the church we had lunch at Chi Chi’s of all places. The real life Tex Mex Restaurant we all know and love from back home. Mes Oui. After Nachos and Chili we walked back to the bookstore because hey, you can never browse enough books wherever in the world you are. Particularly when you can actually read the words on the cover. While Shirl was in the bookstore, I found my way to what appeared to be an actual casino. It was an actual casino… I walked in bold as brass to parlay my single Euros to multiple Euros when the Tres Jolie Mam’selle at the front desk kindly advised…. “Non Non Monseir…. pas de blue jeans”. It seems I forgot my James Bond suit at home and all I had to wear were my trusty “Bleu jeans”. Alas, running up my Euro stash would have to wait. I hooked with Shirl at the bookstore once again and we then went back to the hotel where Shirl cleaned out some more Surface Hippy postings and I read my magazine. We went out for a late dessert and coffee and then to bed. This morning at 12:00 a car picked us up from our hotel to take us to the Villa Cento Passi. The car and driver were arranged by Hugo the master of all things Villa. Kristof the driver was very personable and a pretty good road master. We traveled the 35 K to Gent in about 30 minutes at a steady 140 KPH. Pas de probleme. Kristof took us on a tour of the old town of Gent on the way. This old town is just amazing. The center dates back to the 13th and 14th centuries. We arrived at the Villa and were met by Hugo and shown to our room. We have one of the largest suites and are the first to stay in it. The Villa is just going through the final stages of revision to a full capacity clinic with on site patient accommodation. I’ve attached a photo showing our suite layout. Not too shabby. Breakfast and Lunch are provided in the daily cost of the room ( high but who cares, we only go through life once and we might as well enjoy it). It turns out we arrived just in time for lunch and OH BOY… This is going to be hard to take…. The first lunch course was garlic escargot on toast, followed by breaded chicken filet with tomato and onion sauce with pommes frites on the side topped off with a pastry dessert and coffee. So far this is all going in the right direction…. We met some of the other patients and their partners at lunch and it is amazing how friendly and up beat they all are regarding Dr. DeSmet, the medical treatment they have received and the care and attention that the staff pay to all the guests. After lunch and settling in Shirl and I went for a short walk around the Villa neighborhood. I’ve attached a few pictures of other houses nearby. The best analogy I can come up with is a private clinic set in the midst of Shaugnessy Heights. This is going to be some adventure. It’s almost time for dinner so I’ll sign off for now and get back to you in a few days to bring you up to speed on Shirl’s medical progress. Bye for now . . . Love to all . . .
Well, Hello everybody… Third time lucky and here we go with Email numeral trois… I saved up a bit so it’s a bit of a long one. Sorry to those with short attention spans, Baker One and Brother 2. We went in to the diagnostic area waiting room and in a short time Dr. Koen DeSmet introduced himself and his assistant who would be taking Shirl’s X-rays and performing her blood test. He let us know that the Cardiologist had to attend an emergency at the hospital and that Shirl’s ECG would be done at the hospital on Tuesday after she was checked into the hospital. After her blood test and X-rays were done we went into Dr. Koen’s office ( by now we are on a first name basis with “Coone”, his is a dutch name with the funny dutch pronunciations we are all so fond of ) where he described the procedure to both of us and answered all our questions with a willingness and clarity that was refreshing. He comes across as a consummate gentleman that cares profoundly about his patients and his work. He wants to perform the best procedure possible which is in the best interest of his patients. He explained that Shirl would be picked up at 7:00 am the following morning, be checked in to the hospital. From there they would perform her ECG and then off to the operating theatre at about 10:30. 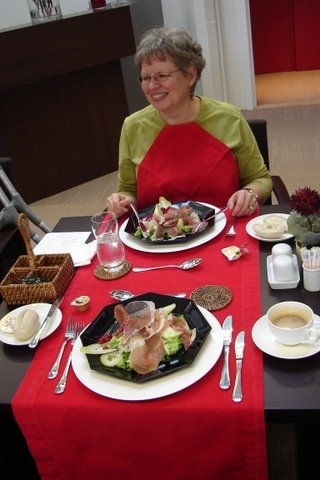 After our consultation with Dr. K we spent some time in our room until lunch… Ahhh … lunch…. Once again a highlight of the day… Fresh pea soup followed by a huge pork chop with cauliflower and cabbage accompanied with boiled potatoes. Wonderful once again, topped off with a deliciously rich pastry treat. After lunch we walked to the local supermarket and got a few supplies. I’ll interject with a bit of the language situation here. When in Brussels everybody basically spoke french and english. Here, just 30 K north it’s completely flemish (a dutch derivative) and a bit of english. All the signage is in flemish, and my flem is not as good as my marginal french, so reading menus and bus routes is a joke. Even so, with my flemish route map in hand Shirl and I ventured onto the tram for a trip to downtown Gent. We transferred once and ended up in the heart of the old town at rush hour. We only had a little while to look around but we did get to go into St. Bravo’s Cathedral. It was old, way old, and cold… No central heat available in the 13th century and I guess they haven’t got into retro mode lately. This cathedral is the home of a famous work of religious art “The Adoration of the Mystic Lamb”. The art is kept in a special area of the church cordoned off, with a special entrance. Unfortunately, the lamb goes to sleep about 3:00 PM and we were at the door at 4:00 PM. We didn’t get to appreciate the painting but we did get to look around the inside of this great old cathedral. It’s the first one we’ve been in so far that specifically forbids picture taking inside.. Sorry … no picture… no picture… But, we did take a picture of the downtown Mc’Donald’s housed in a god knows how old building. After the church tour Shirl was getting a bit tired so we headed back to the Villa and found ourselves a nearby small Greek Restaurant for dinner. The other patients had suggested we have a nice dinner away from the Villa for Shirl’s pre-op dinner because after her operation it would be awhile before we would be able to go out. We ended up at Zorba’s Greek Restaurant, with a menu in hand which we hand know idea how to read. It was all dutch to me. The waiter spoke pretty good english and described what was available and in spite of not being able to read the faire we had a pretty good dinner. After our scampi and lamb it was back home to the Villa to have an early night and get ready for Shirl’s trip to the hospital. We got up a 5:30 am on Tuesday the 14th. Had to get up early to pack for Shirl’s stay at the hospital and meet the cab which would pick us up at 7:00 am. We were down in the lobby by 6:50 am ready and willing to hit the road running. When the cab hadn’t arrived by 7:00 I took a look outside the door and low and behold there were headlights shining through the drizzly rain from outside the gates. I forgot, we are in a haven of tranquility in which we are kept safe from Brussel Sprouts, lurking around after dark, by an encircling art deco brick and wrought iron fence and secure hydraulically controlled iron gates across the single lane driveway. I remember now that Hugo advised me I would need my key to open the gate if I came home after 10:00 PM. I infer therefore, that we are behind bars from 10:00 pm to 7:00 am. Not a bad jail by the way. I keyed in the cab and we were whisked to the entrance of Jan Palfjin Hospital. Kind of like the BCAA where you check in at the front desk and get a number for service. We got our number and then took a short walk to admission. Another short wait, some paper work completed by a very friendly clerk lady who amazingly spoke very passable english. All the paper work filled out and a simple swipe of the AMEX and we were on our way. After this is over we’re hoping we’ll have enough airmiles for an flatscreen TV. The way it’s been going so far, AMEX wise, we’ll be able to trade in our miles for an IMAX theatre. At this point in our lives money is not the issue. Enjoying life to the fullest in the best of health possible is all that matters. So far we are enjoying the whole experience and Shirl has such confidence in “Dr. K and Krew” that she has no trepidation or fear. The admission lady told us to go up to the 2nd floor and we headed up the elevator and approached the first two nurses we saw. Again we started with the universal Gent greeting… “Do you speak english”… once again…. success. The nurses greeted us with great enthusiasm. They were expecting Shirl and knew she was one of Dr. De Smet’s patients. They asked us how we liked staying at the Villa and said they hadn’t seen it yet, since it’s been opened, but had heard lots about it. We told them we would show them pictures when we got the chance. Now the wait begins…. We met the young girl staying with Shirl in her double room and once again, she spoke excellent english. Turns out she was born in Gent and worked for Proctor and Gamble and had done her internship in the states. After a little while the Cardiologist showed up and did Shirl’s ECG which she passed with flying colors. While Shirl was getting tested I had looked for a coffee shop or machine because I hadn’t had anything to eat, I guess in sympathy. There were no machines and the snack bar didn’t open until 9:30 so I was out of luck. When the Cardo was finished and I went back into Shirl’s room the nice young lady room mate offered me her coffee from breakfast. She said she didn’t drink coffee and I was welcome to have it. Needless to say I thanked her much and now was back on track with a bit of a caffeine buzz happening. The next thing on the agenda were crutch lessons by Jean-Paul the physio-therapist. He taught Shirl the correct method for using her crutches and getting in and out of bed after her operation. Once again a very pleasant , friendly and helpful born in Gent. We talked a bit afterwards and discovered he is also a registered acupuncturist and that he teaches as well as practices. Very busy young man. He said it is better to learn how to use the crutches properly before the operation because it is easier to maneuver then, than try something new on a sore hip. By this time it’s getting to be about 10:00 am. Shirl has a great view of the church steeples of Gent in the distance. It’s a very comforting scene. The two nurses we met this morning have showed up and it’s time for Shirl to get ready to go to the big show. I left her in trusted and capable hands and started heading to the Bus Stop. It wasn’t raining so I decided I’d walk back to the Villa. At least until I got tired anyway. Well, Gent is like Vancouver. Was raining, stopped raining, I left hospital, started raining a bit after I was hot on the trail, rained slowed a bit, rain then started to piss down buckets. I made it as far as the main train/bus/tram station and bailed on the walking. A short tram ride later I’m back in my room typing away at the laptop, which by the way, seem’s to be working just fine now Thank You. Time for Villa lunch…. Gotta go…. I’m back….. from lunch… Shrimp croquettes starter, lamb stew main course and apple tort for dessert… It’s now about 3:00 Pm so I’m going to hang around a bit here then head over to the hospital so I’ll be there when Shirl comes around. I arrived at the hospital about 4:30 but Shirl wasn’t back from recovery yet. I waited patiently and she was eventually wheeled back in to her room at about 5:30. She was a little bit groggy but all in all seemed to be in pretty good spirits. She said she had some major pain in her hip just as she was waking up and it was about 30 minutes or so before the got it handled. By the time she was back with me she had no pain and was on a morphine pump… YAY…. I spent the rest of the evening with her as she would slowly drift in and out of sleep. Dr. Koen stopped by shortly after she arrived and told us her operation was very difficult because the type of arthritis she had caused her bone to be very dense, and I guess hard to work with. Never the less, he said the operation was a complete success and tomorrow she would be up on her legs to start physio- therapy. The nurse allowed me to stay after normal visitor hours if I promised to be quiet. I was… And left Shirl resting at 8:45 PM our time. In closing tonight just I want to let you all know the operation was a complete success, Shirl is resting comfortably, we are both well and thank you for your thoughts an prayers. I have attached a photo of Shirl’s view. Everything has been moving along very smoothly since my last note. Shirl has a pretty much fixed schedule of activities and the days are filling up nicely. We are into a very comfortable routine and everything just seems to tick along like clock work. We have a leisurely breakfast and then come back to the room. I usually read while Shirl goes through her Surface Hippy Web Forum Emails. The web site activity takes place mostly overnight our time, and by the time we wake up there’s more than enough postings to keep her busy for quite some time. Around 10:00 AM Marc her physio therapist shows up and they go through the routine of massage, walking and then strength and stretching exercises. After another rest period it’s off to lunch…. ahh.. lunch… I won’t bore you with the details again and only mention it because it’s the highlight of the day and a great time to socialize and compare progress with other Villanites. ( lobster bisque and garlic scampi on Sunday… all manner of smoked salmon, trout and fish stew on Monday…. tomato soup and veal cordon bleu today). After lunch, which ends around 2:30 we have “Free Time”. Yesterday and we went for a short walk outside. Yesterday was very cold and Shirl, for her first walk outside on the sidewalk, only walked a short distance. Today, just after morning physio, it was warmer and we ventured about a 1/4 mile round trip to a very old park just down the block. It has some stonework arbors and there are two very old bronze statues. I have attached a photo of Shirl showing her doing laps around statue #1. We didn’t get down to Statue #2 but it looks way cooler than #1. We were talking to Lucien at lunch today and he says it is a dedication to four brothers who rode in on one horse to do something or other in past history. As soon as I get down to it I’ll send a photo along of “Four Brother’s on a Horse”. In the meantime I’ve got a shot of the houses across the street from the park. At 4 o’clock it’s pool time and Shirl and her other therapist Evelyn and the other guests spend an hour in the pool exercising and I think just have a pretty good time. Our new good friend Jacques from Hong Kong left yesterday afternoon to spend some time with his sister in Lyon before heading home in a few weeks. Some new patients arrived in the past two days and their surgery’s were performed today. It’s starting to get busy again after the weekend and it’s great to meet new people and share stories and experiences. The evenings are usually pretty quiet. Most times we have a very light, shared dinner, from the entree list. After the lunches here that’s usually enough. Today was a pretty big day for two reasons. 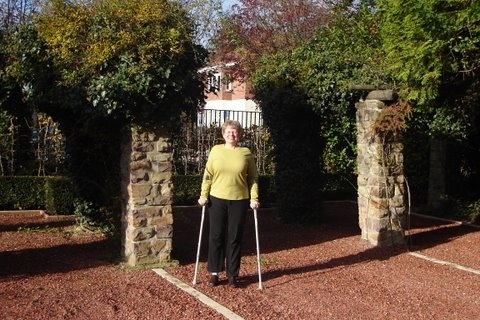 Reason number 1 was the walk around the park… Reason number 2 was that Shirl was able, with Marc’s help and guidance, to graduate to one crutch mode inside the Villa. She’s still a little shaky for walking on sidewalks because the leaves, combined with the uneven paving stones make it a little treacherous…. or maybe a lot treacherous, depending on who’s determining the definition. Last night I called my Mom and Dad, after figuring out the mysterious ways of calling home from the old country. Mom and Shirl had a long talk and Shirl brought her up to speed on all her adventures. We all had a chat to each other and it was nice to hear voices from home which we all enjoyed it very much. We dialed direct from the VIlla and overall it was pretty economical from what I understand can be an expensive operation. We talked for just over 15 minutes and it cost only about 3 Euro $. After we return from dinner it’s rest and relaxation time with Shirl falling asleep and me spending a bit of time on the computer. I’ve been playing some online poker in the evenings and so far I’m in the positive bankroll zone. I’ve attached one last photo in this installment of Shirls happy shiny ( well, maybe kind of squinty due to the sun) face outside the Villa in the sidewalk zone. Shirl has made rapid progress in the last three days and I think we will be able to venture farther afield soon. Stay tuned for further adventures and maybe some pictures of really, really, really old stuff. Not that there’s anything wrong with old stuff. Hi all… It’s been awhile since I wrote so I thought it was about time to bring you all up to speed on progress, and speed street is our home address. Shirl is doing fine. On Wednesday she went for a much longer walk around the block just before lunch. The weather was fine and for a change we went in a different direction than the park. We are in a neigbourhood which is interspersed with large homes and old apartment blocks in a mixed residential/business area. It’s hard to judge how old the buildings near the Villa are but I would guess they are from the 20’s and 30’s. They all have such interesting facades and most have the most interesting doors. I’ve attached one picture of the many I have on file. 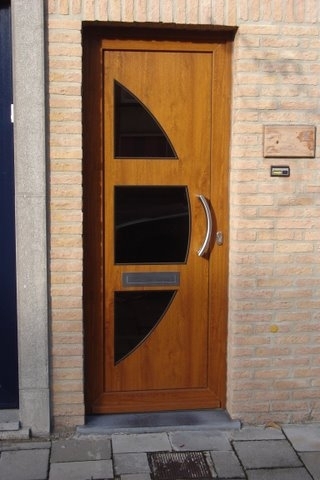 We’re turning into quite the connoisseurs of the Belgian door. In the afternoon Gaetana came to check Shirl’s dressing and we talked about maybe adventuring into the town the following day. Shirl mentioned that she was still nervous to ride the trams yet, and that we would take a taxi to go to the St. Bavo’s Cathedral. Gaetana was so sweet… She asked me if I could drive an automatic.. I said that “Yes, I can drive an automatic, and a standard shift”. She said that if she was at the Villa tomorrow and if we wanted, she would be happy to loan us her car to drive in to town. I had two trains of thought rushing through my mind… The first train left my mouth telling her how kind her offer was but we would feel uncomfortable taking her car without her along, but we very much appreciated her offer and thanked her very much. The second train arrived in the station of my brain announcing “are you fricken’ crazy… the narrow streets, not knowing where in heck I was going because they don’t build right angle intersections in any area of Belgium that I’m aware of. Combined with trams blasting through these multi angled mazes they call picturesque avenues and taxis doing 70 KPH in 30 KPH zones to get through said intersections before the bicycle avalanche arrives… preclude me from even considering taking somebody else’s car into this mess.. Thank You Very Much” Maybe one day, when we come back, I’ll consider renting a car… for now, I’m the Tram Man.. and here’s my trusty pal “Eddie, the Tram Chien”. Thursday the 23rd was a windy, rainy day so we decided to delay our trip downtown and stay in the Villa for the day. Shirl spent the better part of the morning reviewing and replying to her Surface Hippy Web Forum Emails and then we lounged on the second floor terrace area for awhile, watching the wind and rain feeling very cozy. It was American Thanksgiving Day so we were treated to a delicious Turkey Breast lunch and chocolate tort for dessert… here’s a snap of Shirl and our very favorite Lounge Concierge Eric…… haven’t found anything yet that will wipe that smile off Mrs. Baker’s happy face … we went for a short walk around the Villa but it was raining so we cut it kind of short. On Friday, after her physical therapy, Marc said that Shirl was walking very well and she could probably walk unaided sooner than normal if her present rate of progress continued. Because the weather was much better, and bouyed by Marc’s confidence, Shirl donned her trusty New Balance avec Orthotics footwear and ventured out on her first big trek. We asked Katrine at the front desk to call us a cab… “You’re a taxi… you’re a Taxi” she replied… not really… just an old tired joke. The cab arrived and we asked him to take us to St. Bavo’s Cathedral. St Bavo’s was the first church we visited when we arrived a way way long time ago but couldn’t get in to see the “Adoration of the Mystic Lamb”. After you pay your 3 Euro admittance you go into a special niche of the church where the artwork is protected by an apparently bullet proof glass enclosure. You’re given a audio wand which has a prerecorded description of each of the many panels which make up the art piece. It is very interesting and awe inspiring to discover this very special piecce of art. It was completed in 1432 but still looks like it could have been done very much more recently, it is so well preserved. There are logos plastered all over the place indicating “No Picture, No Picture” but I figured, “Hey, I’m wearing my trusty, official RCMP, obtained in Regina baseball cap and all the locals can read “Maintien le Droit”, so I can do anything I want.” So I snuck my camera out of my pocket and snapped a secret mystic photo of the mystic art work…. pretty good likeness, don’t you think? After the church we had lunch in a really nice little cafe on the plaza. Fresh musroom soup and hot rolls with a cappuccino chaser for me and hot chocolate for Shirl. We visted a lace shop and the Shop Lady called us a cab (no joke) and we got back safe and sound. I attached a photo of one of the many classic buildings around the plaza outside St. Bavo’s Cathedral. While Shirl got ready for the pool I took a long walk looking for a bank to cash some traveller’s cheques… and a long walk it was. It turns out that you’re hard pressed to find any financial institution that will entertain the thought of cashing any kind of cheque from a foreigner.. American Express or not. They all told me that they have stopped cashing traveller’s cheques in the past year or so. I did find that the Fortis Bank machines took my RBC ATM card so getting Euros’ in Europe turned out to be as easy as getting Canad’s in Canada. Everybody takes all the major credit cards so you don’t need much cash, but it’s nice to have some browns, purple and blues when you need them. On Saturday, after breakfast we decided we were going to take the tram downtown and in the evening go out for Thai food at a reataurant close by, so we cancelled lunch and dinner at the Villa. After Shirl’s physio it was really windy and rainy so we said forget about going out. We tried to reinstate our Villa lunch meal but because of complications with the caterer we were hooped and couldn’t get lunch on home turf. Dinner would probably work out OK. It was a special situation regarding lunch that Christine apologized profusely for, but in any case we were hooped big time. After hanging about wondering what to do, the rain started to drop off and we walked quite a ways to the local Pizza Hut. Lunch was very good, he pizza was not as greasy as we’re used to from home and the pepperoni was particularly good. Oh well, we still had dinner to look forward to. We set out for dinner just after 7:00 pm and walked in to the fairly empty local Thai boutique. We met the maitre ‘d at the door and asked if he spoke english. He saw Shirl’s crutches and recognized us as being from the VIlla and welcomed us with open arms…. until he asked us if we had reservations at which time we replied “reservations?… we don’t have no stinking reservation…”.. He was very nice about it but had to explain that Saturday night was very busy and even though it was looking empty now, in 1/2 and hour or so he was fully booked up. He apologized quite a lot but still was unable to pity us with a table and invited us back on Tuesday or Wednesday night when it was not a problem to get a seat. Now it was time to renavigate to the closest cafe we knew about, around the corner and up the block. By the time we made it to Sole d’Italiano we were both quite tired and a bit frustrated. We were greeted at the door by “Arturo” who once again recognized us by Shirl’s crutches as being from the Villa and were warmly greeted and shown to our table. It turns out Arturo remembered well one of Dr. DeSmet’s previous patients from Canada and for the rest of the evening we were treated like old friends. Art’s english was about as good as our Italian but we had a great time, a wonderful meal and were able to communicate enough to have a very enjoyable evening. After dessert Arturo treated us to a couple of glasses of Amoretto and sent us on our way in a much better frame of mind than we started out with. Today, Sunday, was Shirl’s big adventure day. 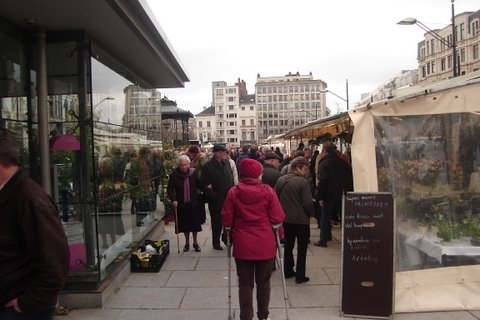 After her morning physio we walked down to the local tram stop and took the tram to the Sunday flower market. 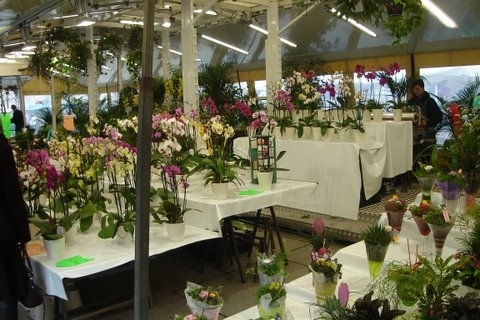 Every Sunday there’s a fresh flower market set up in a town plaza. It was a short tram ride and all the Sunday trams are modern cars with low thresholds so it wasn’t much of a problem for Shirl to get on and off. We spent about 45 minutes walking about and doing a bit of window shopping. On Sunday not many of the stores are open so it was mostly window shopping. I’ve attached a couple of market photos to give you an idea of the variety of all the flowers and plants that have setup every Sunday. 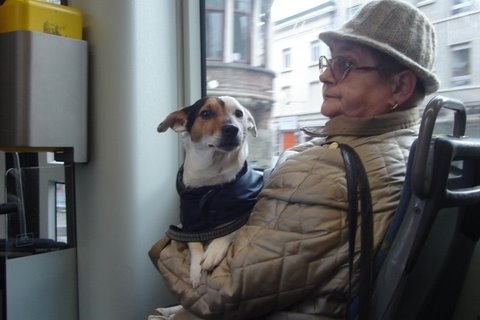 Then we got back on the tram for our trip home. 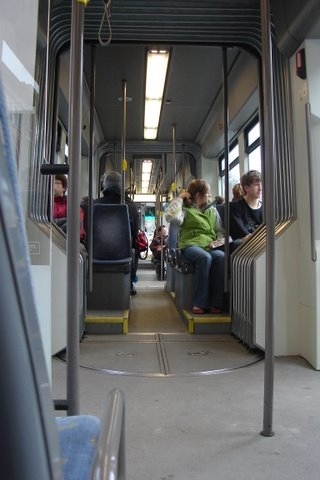 Here’s what the Sunday afternoon tram looks like. Clean, modern and very comfortable. We spent a quiet afternoon at the Villa and had dinner with our good friend Lucien. I’ll probably only get one more short note in before we get home on Thursday so for now…. Hi all… this is our last quick note from the Villa before we leave for home tomorrow. The last two days have been relaxing on day one and a bit tiring today. Yesterday we took a walk in the park, so to speak. There’s a very old park just up the block that we walked about earlier in the trip but yesterday we walked down to the north end where the major artwork is located. Please excuse the brass men with no clothes riding a big brass charger. That’s me, contemplating the 4 brothers riding over the enemy and thinking… “HHmmm…. just how can I get over there to climb up on that big brass horse for a photo op”. Unfortunately the statue is surrounded by water and ducks and I didn’t have my hip waders. Today we hired a car with Kenna-Sue and Howard from Anchorage and went to the old town of Bruges. It’s way, way old and a bit of a touristy place but we were able to see a real Michealangelo sculpture. 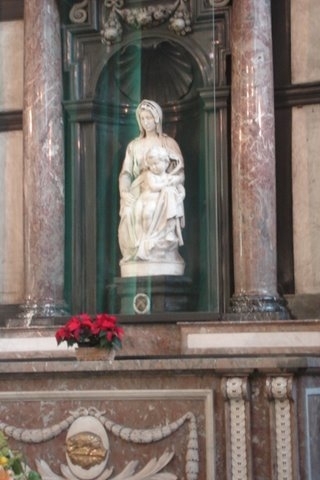 The “Madonna and Child” is located in an old church named “Church of our Lady” which was built in the 13th through 15th centurys. Here’s a photo of the alter and sculpture… The sculpture is the only one of Michealangelo’s works to leave Italy during his lifetime. 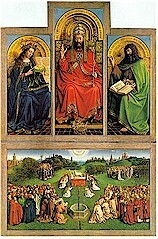 It was bought by a Bruges merchant, Jan Van Mouskroen and donated to the church in 1506. 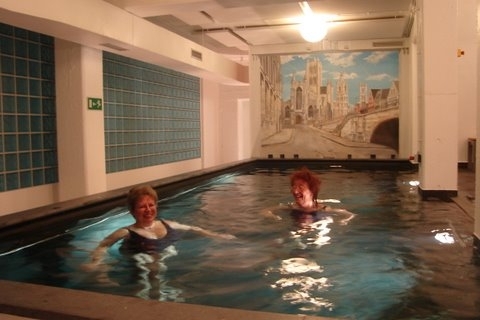 After our day in Bruges Shirl had her last dip in the pool and now we’re ready for dinner. We’ve paid Hugo and now we just have one more sleep before we head home to the snow. This is my last Email of the trip. I hope you have enjoyed hearing about our adventures as much as we’ve enjoyed experiencing them ourselves.